Sport combination watches are straddling quite a tightrope. On the one hand, they have to be very precise and offer many different time-tracking options. On the other, they have to offer all these different features within a package that can withstand a wide variety of stresses, pressures, moisture levels, and dirt. Also, they have to look, well, sporty. Didn’t I say sport combination watches have a tough game plan to follow? Well, lesser brands would probably do a half-baked job due to the many requirements of a proper sport combination watch. But this is Casio we’re talking about so you can be sure this established Japanese digital watchmaker’s rendition of the sport combination watch formula will turn at least a few heads. Packed with a resin casing and held in place by a resin band, the Casio Men’s AQ-S810W-1AV Solar Sport Combination Watch doesn’t hold back when it comes to value. 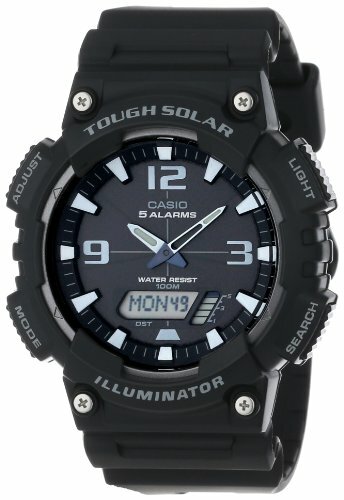 In fact, as you can tell from the inclusion of the term ‘solar’ in its name, this Casio timepiece has quite a trick up its sleeve-it is solar powered. Geared toward the active globe trotter and outdoorsman, this Casio watch is designed from the ground up to ensure that you aren’t dependent on batteries to tell the most accurate time possible. Powered by the sun, you are sure to always know the right time. Besides the current time at your location, this Casio product also tracks time in 48 cities the world over. It also supports different languages. So does this Casio model do a good job straddling the typical design and functionality tightrope walked by combination sports watches? It not only successfully walks the tightrope, it does somersaults as well. That’s how well-put-together this timepiece is. Housed in a compact resin housing, the AQ-S810W-1AV packs a simple face but don’t let its seeming simplicity fool you. It’s four push features do a wide range of things that can serve you well depending on your situation. One button lights up the watch. Another changes watch modes. Another button lets you do adjustments. Finally, another button provides a search function. All this in a light, water resistant, sporty case that doesn’t start to look boring with time. Plus, this unit is powered by the sun so it can continue to provide all the functions you’ll grow to depend on it for without you having to worry about swapping batteries. If you are wondering why this ‘Swiss army type’ timepiece is offered by Casio at seemingly bargain basement prices, you only need to look at its movement type. This unit is powered by a Japanese quartz battery. This not only drops this timepiece’s price drastically, its quartz movement is also Japanese. This means you get a high level of performance at affordable prices. This timepiece not only lets you know the day and date in your location in easy to understand digital form, you also get a powerful chronograph design without the confusing numerals. Everything is digital and this cuts down on your chances of misreading the time or date. As powerful as the AQ-S810W-1AV may be, you don’t get this impression when you check out its price. It is price very affordably and this might make you wonder if Casio made a mistake in pricing this timepiece. It not only packs a lot of features but it also looks great. Considering the Japanese talent of offering technology-packed products at affordable prices, this timepiece definitely fits into a long history of proven manufacturing performance focused on quality and value. In the 2nd paragraph you spelled “sun” incorrectly. 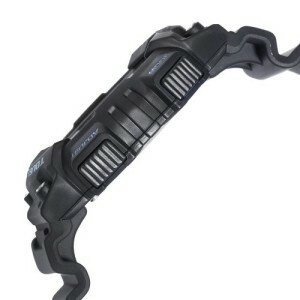 I purchased one of these AQ-S810W-1AV to see if I liked it. It looked great but when I charged it all day, the luminous dials on stay visible at night for about 30 minutes. You think this watch could be defective or just has to be charged longer?